With support from Arts Council England, we are delighted to offer colleagues this conference day to explore opportunities for resilience and sustainability by putting the magic back into our museums. Thackray Medical Museum has benefitted from Strategic Support Funding to develop a new business model for its work across collections, interpretation, education, events, retail, marketing and sponsorship. We will use this project as a starting point for exploring how other museums can develop their own resilience and sustainability. Our keynote speaker will be Jane Walton, Trustee of Thackray Medical Museum. Thanks to Arts Council England, we are able to offer a delegate fee of £25 per person including inspiring talks and practical workshops as well as opportunity to network over lunch and refreshments. We hope to see you at this magical event! Please see link to Programme Conference 04 June 2013 and the form to book a place Putting the Magic Back conference booking form. This entry was posted in Magic and Medicine on May 21, 2013 by magicandmedicine1. Shop now stocking a truly magical collection of toys! 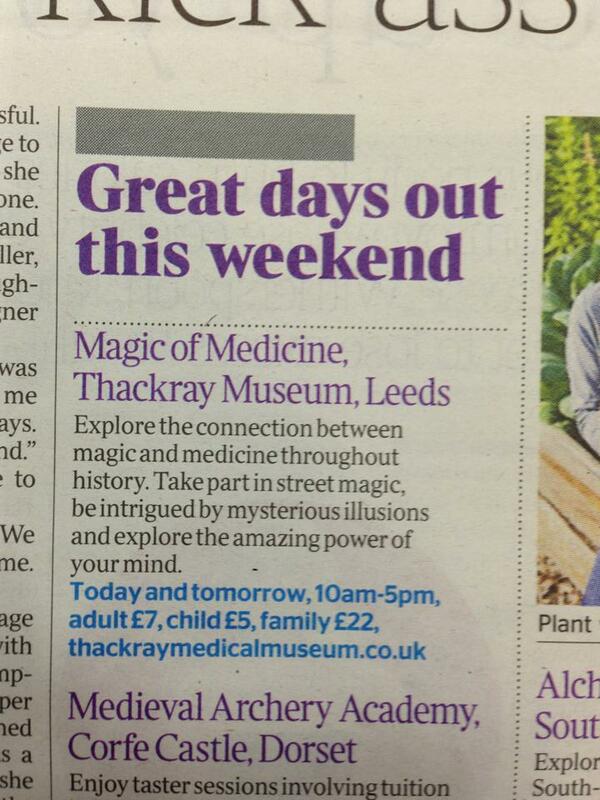 After visiting The The Magic of Medicine exhibition at Thackray, be sure to pay a visit to the Curiosity Shop. A variety of magical merchandise can now be found, perfect as a souvenir of your visit or as an unusual gift. Our magical range includes painting books, science kits, juggling balls, adult and children’s books and black cats and owls. Open to non museum visitors. We will soon be launching our online shop – watch this space! This entry was posted in Magic and Medicine on April 30, 2013 by magicandmedicine1. The Magic of Medicine gets featured in The Times! This entry was posted in Magic and Medicine on April 21, 2013 by magicandmedicine1. The exhibition opened on Good Friday, 29th March 2013. We were delighted to be joined by Yvonne Farquharson, Breathe Arts Heath Research and David Owen QC, who gave us a fantastic talk about the historical links between magic and medicine, and performed some truly mind bending tricks. Visitors to the exhibition seem to be delighted by this new way of presenting the magic of medicine in history, literature and therapy. A big thanks to Catherine Candlin for taking these fantastic photos of the exhibition. This entry was posted in Magic and Medicine on April 17, 2013 by magicandmedicine1. The Magic of Medicine exhibition opens this Friday! 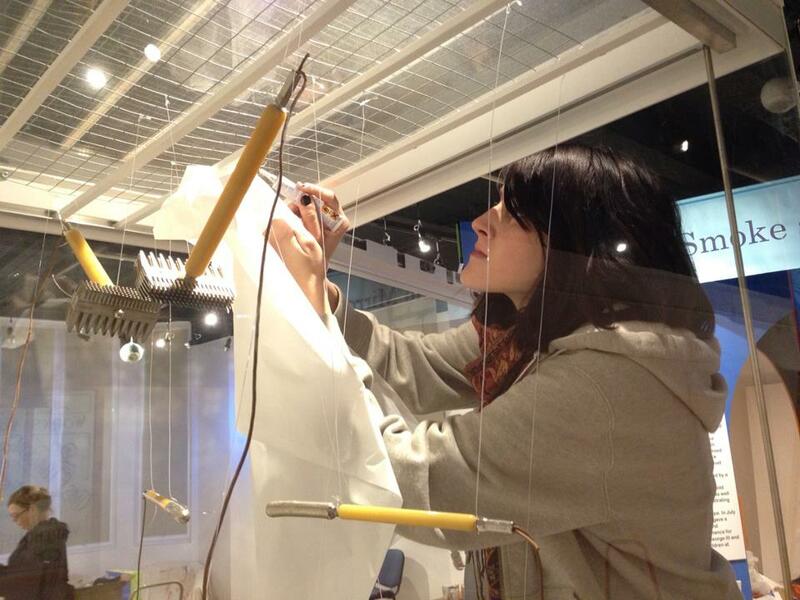 Gemma has been putting together the final touches to The Magic of Medicine exhibition, which opens at the Thackray Medical Museum in Leeds this Friday from 10am! We look forward to seeing you there. This entry was posted in Magic and Medicine on March 28, 2013 by magicandmedicine1.